Video of my talk has been posted (below), though watching it and listening to myself feels pretty damn weird. I've been blown away by response I've gotten to this talk. I know of at handful of companies circulating these slides/notes internally and working to make their companies more transparent. I've personally heard from a number of people at the conference that were discussing the ideas with their coworkers thinking about the best approach to take action. Even Facebook (the example I used of how not to handle downtime) has found resonance with the talk, and pointed me to a little known status page. 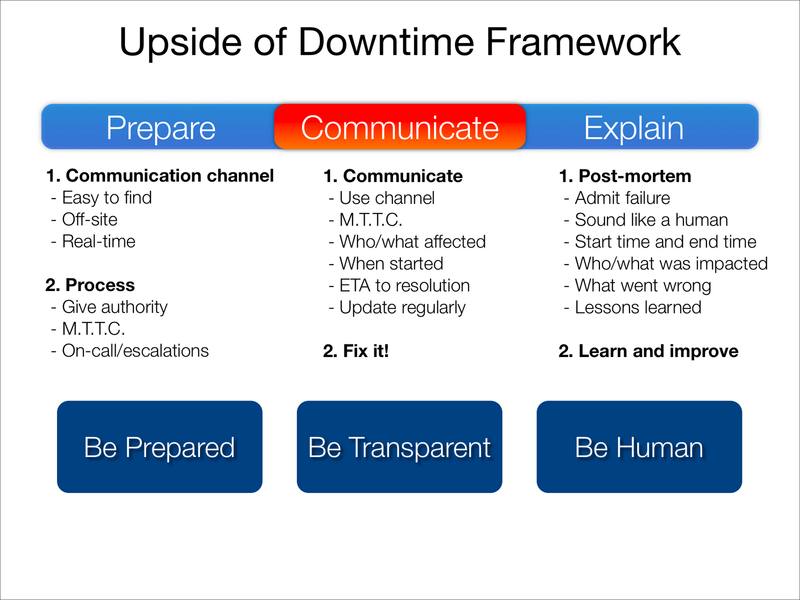 I'm hoping to start a conversation around the framework and continue to evolve it. I'm going to expand on the ideas in this blog, so if there is anything specific you would like me to explore (e.g. hard ROI, B2C examples, cultural differences, etc), please let me know.